It is with our deepest regards to announce the passing of Retired Fire Chief Carl Trievel. 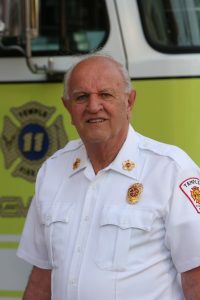 Chief Trievel first joined the Temple Fire Company in 1966. He served as the Assistant Chief from September 1978 till June 1980. Then from June 1980 till December 1988 he served as the Fire Chief of the Department. He recently started coming around and hanging at the station with some of the members. You may have even seen him respond to a few calls with us. His passion was with the Temple Fire Company. When he retired as Chief at the end of 1988, he left some really big shoes to fill. His legacy for our department will never be forgotten. We thank him and his family for the hard work he provided for the Borough of Temple. If any department is looking to provide any apparatus to the funeral on Saturday, please contact the Berks County Communications Center or you can call Fire Chief Craig Reinhart direct if you have his number. Our station number is 610-929-8050. Please see below for all info that pertains to the services. Friends and family are invited to join Barbara and her family for a viewing on Friday evening, October 26th, from 7 p.m. until 9 p.m.
A funeral service will be held on Saturday, October 27th, at 10 a.m. in the Milkins Giles Funeral Home Inc., 4914 Kutztown Road, Temple, Pa., with Reverend Lesley Hand officiating. A viewing will be held Saturday one hour prior to the funeral service. Following the funeral service on Saturday, a fireman’s procession will depart the funeral home and proceed to Berks County Memorial Gardens in Maidencreek Twp., where interment will follow. Research Hospital, 501 St. Jude Place, Memphis, TN 38105.